It is the film that everyone will have a take home image from. It is not merely a spectacle. Dunkirk is an experience. My take home moment is not a shot or a scene but a sound. Early on the deflated and defeated British on the beach lift and turn their heads in terror as the drone of a plane soon to attack them approaches. We do not see the plane. I watched in IMAX and my seat shook at the sound of the approaching Luftwaffe. It is the same pulsation of sound coursing through your veins, and the same terror I felt, when together with friends on an afternoon visit to the South of Lebanon in 1997, we heard an Israeli Air Force craft in the near distance zone in. Whether you have been in a war zone or not, there will be something in Dunkirk that resonates with everyone who watches it, because it is about heroes. It is a Nolan masterpiece, and yet very un-Nolan. Without exposition from a film-maker usually obsessed with the back-story of his characters, this never claims to be a documentary but is clearly an homage to brave men who gave their all in the fight against Nazi Germany, and whose humiliation in Dunkirk is here celebrated as the victory of survival. How odd then, that this film should now be celebrated by right-wing figures, Nigel Farage being the obvious one of note. I don’t recommend it, but if you have to trawl, as I recently did, through threads on posts by far-right figures, you will find that alongside lions and crusaders, the iconography of the Second World War is rife. Back in June before the film’s release the furore over this year’s Al-Quds Day march, in support of the liberation struggle of the Palestinians was initially generated by a group of Zionist organisations. Their campaign was quickly picked up by Tommy Robinson, and by the time of the march the EDL, Britain First and other far-right social media spheres had become obsessed with the ‘idea’ that ‘support[ers] of jihadi terrorism’ were marching through the streets of London. One educator from StandWithUS, whose video message to London Mayor Sadiq Khan was viewed three quarter of a million times and can be found across Robinson’s social media presence and in other similar quarters, claimed that the ‘enemy’ must be named, and inferred that current times were worse than the Nazi blitz. That ‘educator’ named the ‘enemy’ as ‘Islamic’. Al-Quds Day, the later PalExpo, and pro-Palestinian solidarity across the board, in this type of narrative is not what, so many in their oft misspelled misguided expressions claimed, their forefathers had fought for in the Second World War. The now firmly embedded idea of British Values and Freedoms was posited against justice for Palestinians. Despite, however, the support of Tommy Robinson or Jayda Fransen for Israel, on those threads sitting seamlessly and without contradiction were posts from (let’s be clear here) other fascists, hailing death and all sorts of ills not just to Muslims, but also Jews. ‘Gas chamber”, “Gas them all,” – it won’t take long to find such comments on posts about both Muslims and Jews, often together, as what the Nazis did and what the ‘British’ should do become collapsed into one train of thought. This strange and perverse historiography should shock no-one. For a long time now, Islamophobic narratives, whether of Muslims as the nemesis of British values and freedoms, trying to undermine democratic institutions through entryism, sexually abusing British girls, and murdering British people, have been promoted via the mainstream and institutionalised through policies like Prevent, leading the far-right charge against the enemy within. Those stereotypes find succour in long held prejudices written about elsewhere, centuries old, that in the past and the present hold up the pillars of colonialism. Dunkirk now celebrated a la Nolan, finds a place in this increasingly strange iconography. There has been much, in fact much more than I expected, critique of the film as a whitewash of actual history. Yasmin Khan argues that there is a ‘strange determination to misremember’ the empire, and a need for modern Britain to honestly face up to its history in order to understand its present. Others have referenced Khan’s book The Raj at War: A People’s History Of India’s Second World War. William Dalrymple (in The Spectator of all places) uses it to place the Indian Army Corp on the beaches of Dunkirk (not a brown face in sight on the screen), and two million Indian troops on the front lines throughout the war. Manimugdha S Sharma in The Times of India goes into meticulous detail of how and when that deployment took place. Salil Tripathi explains how the film ‘reinforces Britain’s self-image. And in not seeing the wider canvas, Britons see a distorted reality, which influences attitudes, and indeed, politics.’ Others still link this self-image to the post-Brexit world, and mostÂ highlight the role of Empire’s cheerleaders particularly Niall Ferguson for hyping up a nostalgia and amnesia regarding Britain’s not too distant colonial past. When ‘recalled’ it is a history of benign rule over lesser peoples unable and unworthy of the freedom the British eventually deigned to give them. Sunny Singh highlights another image, one that came to my mind too, of the photos of the liberation of Paris. The erasure of (almost all) non-white faces from Dunkirk is a mirror of the deliberate erasure of non-white faces from these staged images and this staged history. There are the odd ‘ethnic’ faces in the film. They are French soldiers, and the French do not come out of this movie well, though that is another article in the making. As it happens there were maybe only 600 or so Indian troops on the beaches, small in numbers for that occasion as many have remarked. But they were there. At a time when little Englander nationalism is on the rise, not recognising that in a picture that will undoubtedly become iconic in its representation not just of the mass evacuation but the faces of Britain’s war effort per se, is highly impactful. In failing to recognise who exactly stood side by side throughout those bloody years, simply heightens the misremembrance, unwitting or pernicious, Khan and others have eloquently outlined. Just as Britain’s forces drew heavily on the empire, at the outbreak of the war French forces contained huge numbers of colonial soldiers. In fact 17,000 black, mainly West Senegalese soldiers were captured and executed by the Nazis when France fell early on. In our book on anti-Muslim experiences in current day France, Saied Ameli, Ehsan Shahghasemi and I highlight the removal of non-white faces from the Liberation photos. The incident was exposed in the English media by Mark Thomson, who found a memo by the joint chiefs of command seeking to ensure that images of the liberation to be sent around the world had no black faces. In the end, there were not enough white troops to be found, and so those who could ‘pass’ as white from North African companies were added into the photographic charade. That lack of white faces belies the shocking truth that when the allies took Algeria back from Nazi and Vichy forces in 1942, the ranks of the free French army swelled from 50,000 to half a million. It is the secret history of the liberation of Europe by non-white troops not just fighting in far flung parts of the globe but on the very ground exalted now as a Europe that needs to be voided of non-white faces and non-Christian bodies. This discourse of a resurgent right, thought to be defeated in that war now usurps the war’s symbols as its own. One more image, this time one we used on the cover of our book comes to mind: a policeman looks for evidence between the rows of Muslims graves, desecrated, many with racist graffiti including swastikas, in Arras, northeastern France. They are the graves of 500 Muslim soldiers and continental Europe is littered with these, yet we only see them when mainland Europe wishes to expel them literally and expunge them from their history. The attack took place on the eve of Eid-ul-Adha in 2008. As well as the name of the solider each gravestone states ‘Mort pour la France’. Died for France. While the erasure of the dead and living from the history of the liberation of Europe is now being called out, and its impact in expelling the racialised other from the British psyche condemned, the bigger picture remains obscured by cultural vehicles that either erase truth or regurgitate stereotypes of Muslim / black / brown / otherised communities. Deleted from the history of liberation, these communities, or the idea of them lurk in the ‘new’ / ‘old’ colonial imaginary. 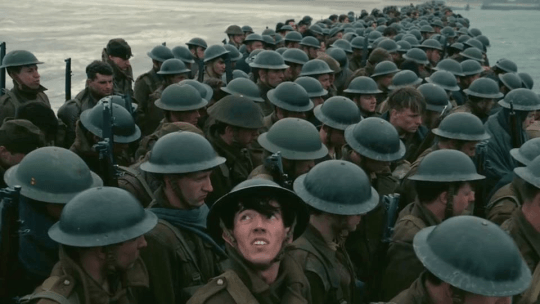 Nolan’s depiction of British troops awaiting evacuation in dire circumstances is a roller-coaster suspense ride, full of menace and the foreboding of doom at every turn. There are U-Boats and torpedoes, Nazis behind sand dunes using a Dutch rescue ship for target practice, Luftwaffe in the sky raining down hell on all below. But they are not seen. There isn’t a single face bar a few heads at the end carting off a heroic and stoic Tom Hardy to internment. And so the audience must fill this space with its own imaginings. But we are no longer in the post-war era, but an era of permanent war. This generation is not brought up on a diet of black and white war movies, or Colditz, or even the outrageous ‘Allo ‘Allo, but Zero Dark Thirty and American Sniper. It has been fed on an endless gorge of Islamophobic and racist newsmedia. This generation pictures its enemy as something other. Dunkirk then, as a metaphor is a dangerous one. Whilst the film’s lack of exposition is cinematically masterful, it’s politically and socially rueful. Further it is terrifying for those whose real lives are pictured as other in the wider nationalistic dream that the movie gives succour to. It is more precisely a nightmare wherein celebrating the defeat of fascism whilst pursuing a fascistic cause are not contradictory. In Rochdale last week the EDL convened, and amongst the speeches made was the claim that this (‘Muslim paedos’ and Muslims per se) was that this is ‘our country’, and ‘we built it’. In forgetting that not only did the people of the empire build this and these countries, at the cost of their own freedom, they also fought and died for them. Yet this rhetoric posits the very same men and women as the thing that was and is to be destroyed. The police are investigating still, but it has been much reported that Darren Osborne, awaiting trial for the attack on mosque worshippers in Finsbury Park on June 18 this year, did in fact mean to originally target Al-Quds Day. Far-right social media has lauded his attack, emboldened by what many describe as this ‘soldier’ and this ‘warrior’. Whilst the tropes that construct Muslims and Jews as the antipathy of the ‘West’ are old, the institionalisation of the war on terror has created a culture of war without end that is enlisting more and more ‘soldiers’ into its ranks. This is not a mobilisation for liberation, and we need to recognise whether in the cinema or on the streets which way of thinking, acting and warring we are increasingly siding with. Arzu Merali is a writer and researcher based in London, UK. You can email her on arzu[AT]ihrc.org and find her on Twitter @arzumerali.